Tiffany McCormack, MD highlights the various advantages of reducing the appearance of cellulite on the thighs and buttocks with revolutionary, non-surgical Cellfina. Reno, NV — Distinguished by dimples and depressions on the surface of the skin, cellulite is a cosmetic concern that affects the vast majority of women over the age of 20, says Dr. Tiffany McCormack, a board certified plastic surgeon in Reno. Enhanced by such factors as skin thickness, genetics, and/or simply the way one’s body distributes fat, she explains that cellulite forms when pockets of fatty tissues press on specific connective bands underneath the skin, causing them to pull the skin downward. Some of those most common areas in which this occurs include the buttocks and thighs. For individuals interested in reducing the appearance of cellulite in these specific regions, Dr. McCormack offers a nonsurgical, minimally invasive treatment known as Cellfina™. “Using a tiny device (similar in size to a needle),” states a recent blog post on her website, “light, quick pressure is applied to targeted connective tissues underneath the skin, eventually causing them to fray and release.” Once this happens, the article notes that the surface of the skin in the treatment area should smooth and even out for a rejuvenated aesthetic. Though other cellulite treatments – such as Cellulaze™ – are also able to achieve exceptional outcomes for qualified patients, Dr. McCormack states that the effects of no other alternative can compare to the longevity of results attained with Cellfina™. In fact, she continues, one year is currently the longest FDA clearance for any cellulite treatment available. 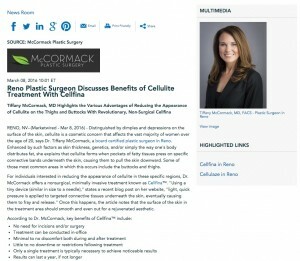 Ultimately, Dr. McCormack notes that Cellfina™ should be performed for qualified candidates by a credentialed and experienced physician, which is why she advises anyone interested in the procedure to consult a respected board certified plastic surgeon. By doing so, she says prospective patients can help ensure they receive the safest, most effective advice and care for their unique needs. Dr. McCormack obtained her medical degree from the University of Arizona, College of Medicine and completed her training in plastic surgery at Stanford University Medical Center. She is certified by the American Board of Plastic Surgery, and she is a fellow of the American College of Surgeons. In addition to Cellfina™ and Cellulaze™, Dr. McCormack offers a full range of aesthetic surgical and non-surgical procedures for the face, body, and breasts. She also provides an expansive array of medical spa treatments, including cosmetic injectables and laser rejuvenation. To learn more, visit plasticsurgeryrenotahoe.com, mommymakeoverreno.com, and facebook.com/McCormackPlasticSurgery. Dr. McCormack is available for interview upon request.